One splendid afternoon, basketball superstar Michael Jordan slipped on a pair of loafers, some cool slacks, and what appears to be a Timex. "What a fine day!" 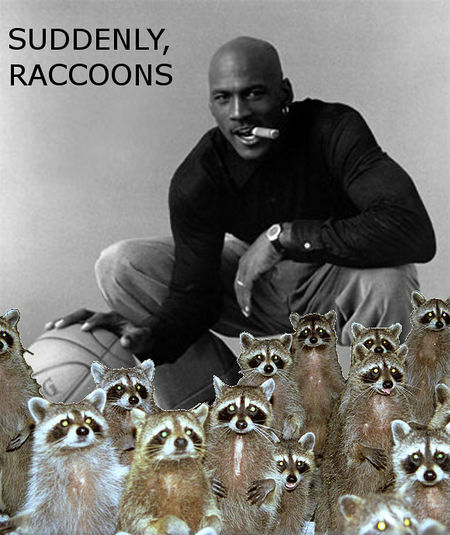 exclaimed Mr. Jordan. 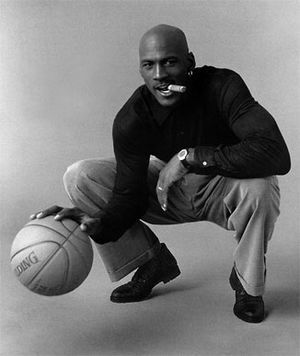 "I think I shall chomp on a cigar whilst bouncing, or 'dribbling,' a basketball very close to the floor!" Mr. Jordan was pleased with himself. "What a fine day!" he repeated, exclamatorily. "I certainly hope my splendid afternoon isn't interrupted by some kind of annoying nocturnal omnivor-"
This article was to be featured on Uncyclopedia's front page when SUDDENLY, RACCOONS! This page was last edited on 11 February 2018, at 15:22.